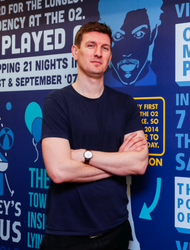 Gareth has responsibility for O2’s partnerships with AEG and Live Nation, The O2 arena, 20 O2 Academy venues nationwide, O2’s long-standing England Rugby sponsorship, and the market-leading Priority Tickets. A Law graduate from Cardiff University, Gareth has previously worked for Barclays on their Premier League sponsorship, held agency roles for Coca Cola, EDF Energy and William Hill, before joining O2 in November 2012. Gareth is part of Marketing Week’s Power 100, marketeers recognised for leadership and creativity. O2 has 25 million UK customers, with a 25% market share. Music is at the core of the brand and business, a strategy that continues to innovate and lead from the front for the digital telco. Launched in 2008, Priority Tickets is a digital loyalty programme giving O2 customers access to tickets 48 hours before general release. O2’s ‘walk to stage’ advertising is famous and helps artists sell out their UK tours. The multi-channel creative campaigns have starred Ed Sheeran, Beyoncé, Michael Bublé, Lady Gaga, Foo Fighters, Coldplay and most recently Shawn Mendes. In 2018 O2 joined forces with the Fan Fair Alliance to put customers, gig goers and music lovers first in the ticket resale market. O2 and the FFA work together to ensure that as many Priority Tickets as possible are going to genuine fans. O2 are the Marketing Society’s ‘Brand of the Year’ and were recently awarded icon brand status in the UK.